For CE managers, learning how to interpret content engagement metrics is key to developing a successful strategy to increase course completion rates. In this post, we discover how to decode critical data and glean the insights you’ll need to help your learners complete CME activities. Low activity completion rates—barring an LMS design problem—is often a content issue. Understanding why learners leave activities early will help you make the curriculum more immersive and improve course completion rates. How long do users stay with an activity before taking an extended break? How frequently do students with knowledge retention issues quit after more than one unsuccessful assessment? You’re likely aware that repeated low scores for large numbers of learners may mean that the curriculum is not agile enough to meet learners’ specific needs. You might not know that when your learners give up after a few discouraging quiz results, it could mean that they don’t trust that reviewing your content again will help them successfully learn the material. That trust issue can be easily solved by proving to your struggling learner that your curriculum can work for them. If your LMS platform supports it, introduce instant feedback within quizzes and assessments, guiding students back to the content that they may have missed. At which point in the course do students with high pass rates in assessments abandon activities? Motivated learners with excellent assessment scores have little reason to abandon their studies. If they are doing so in significant numbers, then look for patterns in the points of the course where most stop engaging with the material. If you find it, that’s the scene of the crime—your content has started to bore your most capable learners. To fix this quickly, you’ll need to introduce new elements to your curriculum that makes learning more stimulating an immersive for high achievers. While you can’t simply make the entire curriculum more complex to keep some of your learners engaged, you can use “gamification”—in which learners are rewarded for completing tasks— to offer original content (such as interactive videos) which can be unlocked for meeting certain challenges. This course feature isn’t usually possible except through an enterprise-grade LMS. For example, the EthosCE LMS platform allows you to integrate original Flash learning content, as well as games, interactive video, and presentations from applications like Captivate, Articulate and Adobe Presenter. Motivated learners complete their courses—as long as they are happy with the form and delivery of the content that they interact with. The key to keeping your users on the road to course completion is stopping them well before they get off track. To do this, you’ll need to look at user poll data to find out how your challenged and high achieving students are feeling about your content before the minor issues they may experience become dissatisfaction. If your LMS offers the capability, use in-activity instant feedback to identify pain points within your users’ learning experience. Allow users to click to offer a review of an activity (“Was this section helpful?”) and provide an automated, but customized reply (“You can find another explanation of this concept on the next page”) which let’s them click through to the answers that they need (“Look at Unit 3 to watch the video.”). Using learners’ feedback, you can craft individualized learning experiences on the fly, letting users engage with the content that works best for them. It’s perhaps the most basic premise of any educational exercise— how well your learners perform during assessments reflect how much knowledge they retain from your content. When looking at content engagement metrics to help your learners complete CME activities, the most important question isn’t how much knowledge your learners retain, but how long they will retain it? When learners feel as if they are gaining new, relevant knowledge through the learning process—then they will become engaged. If they receive constant reinforcement that the new knowledge will “stick” and become useful later on, they will sustain that engagement and remain committed to their course. Inspiring that commitment can only be accomplished by instituting frequent assessments which—rather than having a punitive approach to wrong answers—use mistakes to reinforce important ideas by linking to relevant content. This pool of data also provides the most accurate portrait of each user’s learning path. When coupled with insights from content engagement time and learner satisfaction data, it is possible to anticipate trouble spots for learners and keep them on track. Using content engagement metrics is an integral part of encouraging learners to complete CME activities, but to optimize the value of your data, you’ll need to have a robust LMS capable of simplifying many of the tactics we discussed above. 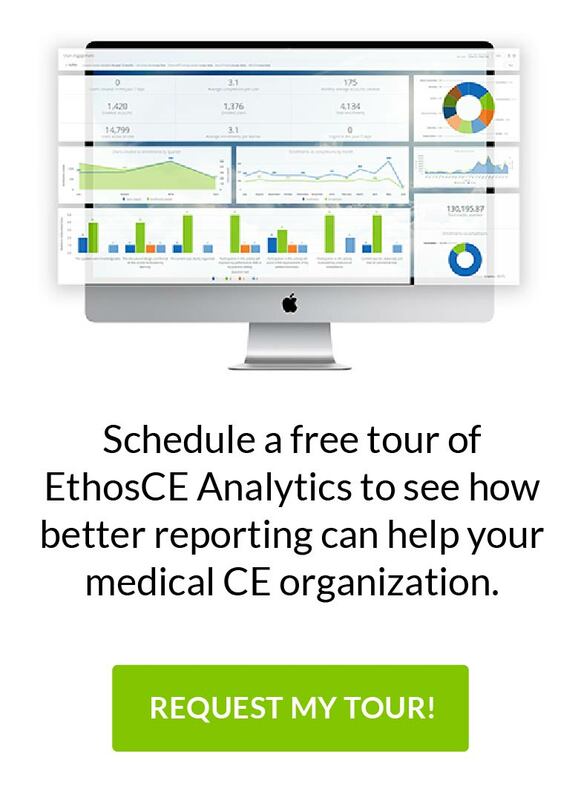 By using the EthosCE CME platform, CE managers can focus on developing engaging learning experiences which encourage course completion and knowledge retention. We’ve helped medical associations of every size streamline their CME operations and engage their students with innovative educational programming. If you’re ready to transform your CME program, connect and let us show you how we can work together to reach your goals.